Earnestine E. Culpepper, Daughter, F, Wh, 1 2/12, sng, MS/MS/MS. Obituary for Myrtle Culpepper Gartin (#10818), published 20 May 2006. Retha Culpepper and Jeff Catlett married 19 Jan 1935 in Kemper Co., MS.
Obituary* 20 May 2006� Services for Myrtle C. Gartin will be held today at 2 p.m. at Stephens Funeral Home Chapel, with the Rev. James A. Ruffin officiating. Burial will be in Magnolia Cemetery. Mrs. Gartin, 82, of Meridian, died Thursday, May 18, 2006, at Jeff Anderson Regional Medical Center. Survivors include her husband, Algie P. Gartin of Meridian; two daughters, Alaine Morgan and her husband, Oscar, and Nancy Sterling and her husband, Mike, all of Meridian; two grandchildren, Kelly Sterling and Michael Sterling, both of Meridian; two sisters, Freda Bates and her husband, Frank, of Birmingham, and Ernestine Blackwell of Navarro Beach, Fla; six nephews; a niece; and her special cousins, Louie and Betty Poythress of Meridian. She was preceded in death by her parents, Ernest and Marquerite Culpepper. HNR DSCG, Fargo, North Dakota 1 May 1925 - Sgt. DEML (ROTC) North Dakota Agricultural College. 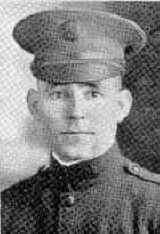 Chris was awarded Mexican Border Service Medal and World War I Victory Medal. Biography* � Chris was apparently born in Corsicana, Navarro County, TX, on 18 Oct 1878. He is not listed in early Navarro County birth records. His mother is said to have died at birth. Chris enlisted in the U. S. Army 14 May 1904, at Houston, Texas and stayed in the military through 1932. In his military records it states that C. C. Lowery of Lufkin, TX, was his uncle. Caroll C. Lowery, butcher, was living in Lufkin, Angelina Co., TX, in 1900. He was born in GA in April 1852. His wife Lizzie was born in Arkansas in November 1860. Her father was born in Kentucky, her mother in Missouri. Both of Carroll's parents were born in Georgia. The couple was married about 1883 and had eight children in 1900. It is not clear whether Chris was related to Caroll or to his wife Lizzie. Her maiden name is unknown. But these were apparently relatives of Chris's mother, who died young. Chris also stated in his military records that his father was killed in a railroad accident. Sherwood Culpepper, his father, was a locomotive engineer. The date of this statement is not known. Chris has not yet been found in the 1880 or 1900 census. He was in Valdez, Alaska, in 1910, with the military. In the 1920 census, he was an enlisted man at Camp Del Rio, Val Verde Co., TX. He was 42 years old, born in Texas, and was serving in Co. B., 3rd U. S. Infantry. From 1922 to 1932 he was in the service of the ROTC program at the North Dakota Agricultrual College. His daughters were born while he was employed by the college. He was listed there in Barnes, Cass Co., ND, in the 1930 census. Middle initial P. is from the brief obit for C. P. Culpepper in the Port Arthur News, 12 Sep 1936. Christian Culpepper, Lodger, Male, White, 31, born Jul 1878, age 21, Single, TX/TX/TX. Chris Culpepper, M, 42, D, TX ENG ENG, Enlisted man-US Army. Cass Co. ND Marriage License Index: #08611. Bettie Lou Culpepper, 8 mos, F.
Mildred Redenbaugh, Sis-in-law, F, 12, ND,/Germany/MN. Chris Culpepper, Harris Co., Sep 12 1936, 45590. Clair Culpepper, Harris Co., Sep 13 1936, 45524.